Earnings performance is a good indicator of the overall economic performance of Tesco. All parts of the “market” are economically attractive and consequently a “high market share” must be a good thing. Both of these assertions or beliefs are highly dubious. On 21st July 2014, Tesco replaced its previous CEO, Philip Clarke. On that day the share price closed at £2.88. Within weeks Dave Lewis, previously of Unilever, was appointed as CEO and by the 1st September he was at his desk, presumably ready for the challenges ahead. Of course, the shareholder perspective is rarely touched upon by the media – probably because it appears a little “dry” or not even newsworthy. From our perspective, this has always seemed a little odd. Tesco’s shares reside in most of the corporate and personal pension plans in existence in the UK so there is a good case for Tesco’s capital market performance to garner a higher profile. Then again, perhaps the company does not help itself – for instance, in the Core Purpose and Values section of the company’s website the ‘shareholder’ is not mentioned. We keep coming back to this point, but the reminder is nonetheless very necessary. If the company is NOT being run for the benefit of the shareholders – who ultimately own the enterprise – then for whose benefit is it being run? 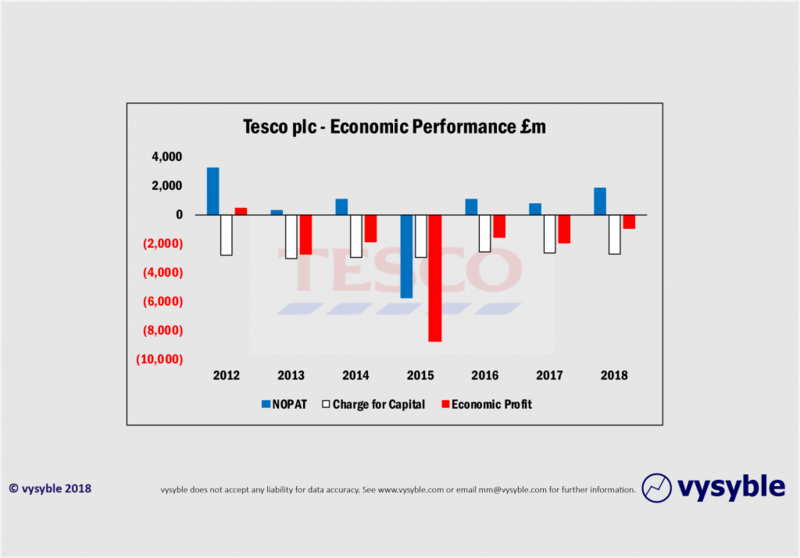 Despite all the above, there are tentative signs that Tesco’s performance, whilst not in economically positive territory, is nonetheless improving. By way of background, we believe that value is created by investing capital and generating a return greater than the cost of that capital. Furthermore, we believe that economic profit, defined as net operating profit less a charge for all the capital used by the business, is the best metric to fulfil such a definition and consequently is the best surrogate over time, for the trajectory of the share price. Set out below is the economic profit performance for Tesco split into the constituent parts of the calculation. In the year to February 2018 the company posted an economic loss of £958m, up £1,015m on the loss of £1,973m for the year to Feb 2017. According to the ‘experts’, the company is well on its way to recovery. However, the economic picture highlights an economic loss of close to £1bn based on the latest full year accounts. In 2011/12, Tesco produced an economic profit of £398m from a NOPAT (Net Operating Profit After Tax – see methodology) of £3,191m and a capital charge of £2,793m. Interestingly, in the latest results for 2017/18, the company produced an economic loss of £958m from a NOPAT of £1,815m and a capital charge of £2,773m. Therefore, despite all the changes initiated by the CEO Dave Lewis, the capital charge has barely changed over the intervening six years having remained around the £2.7bn – £2.8bn level. Or to put it another way, if Tesco is to become economically neutral with its current capital base then NOPAT must rise by £958m – or 52.7%. Whilst we are encouraged by the latest numbers (against a backdrop of financial carnage throughout UK retail, the effects of Brexit etc) perhaps a more sobering assessment of the company’s recovery to a position of economic surplus given the above is required? In all sincerity, we wish the company and its management team every success. Indeed, from an earnings perspective the business would be judged as doing well. However, we know that beneath the surface there will be a mix of business areas exhibiting value-creation and value-destruction, each aspect of which demands a very different strategic and operational approach. From experience, we would not be surprised if capital is being allocated to activities and areas that are indeed value-destroying and, more worryingly, management is being incentivised to do things contrary to the interests of the shareholder. 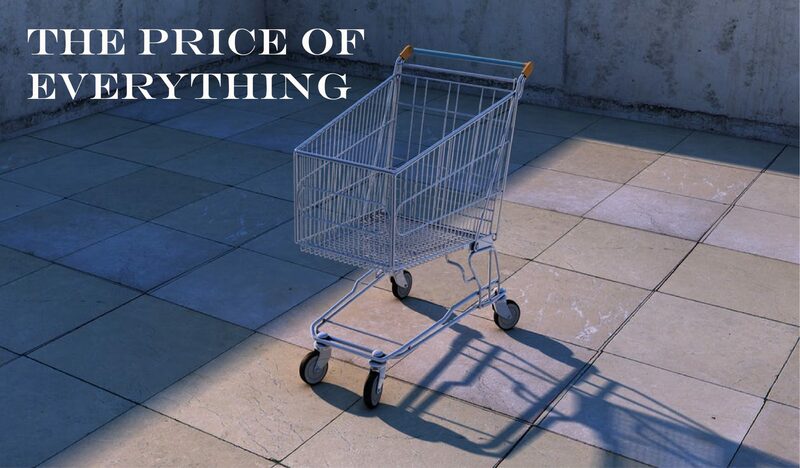 Corporate and business objectives need to be aligned with value. Management needs better visibility of the sources and drivers of value creation and destruction across and within the various businesses. This should inform strategies and management priorities and also the trade-off between growth and profitability. Key managers need to have the “skill and will” to manage for value. Value-based managers are trained, not born. Blockages to value creation in areas such as structure, roles, responsibilities, management reward and management information need to be identified and removed. None are sufficient on their own – all are essential ingredients. So, go and compare the above six points with the content of Tesco’s latest company report. You will find that none of the above feature. Not that it comes as a surprise. We have previously written about Tesco and we find ourselves returning to the same issue – the vision is still blurred with the company stumbling around the depths of negative economic performance. Given the established correlation between positive economic performance and increasing total shareholder returns, it can only be in Tesco’s interest to grasp the value-driven nettle.